Yippee... I just finished two more wool projects for our B-a-a-a-a-d Girls Club at Cinnamon's Quilt Shop here in Jacksonville! We are kicking it off this coming new year and I can't wait. Here are my 3 finished projects that we will start with! I put small antique pearl buttons on the center of each yellow flower ! She seeketh wool and flax and worketh willingly with her hands. This certainly fits me doesn't it? Maryellen's Garden - The center is wool applique - using Valdani buttonhole stitch. Gosh, this was great fun to make!!! 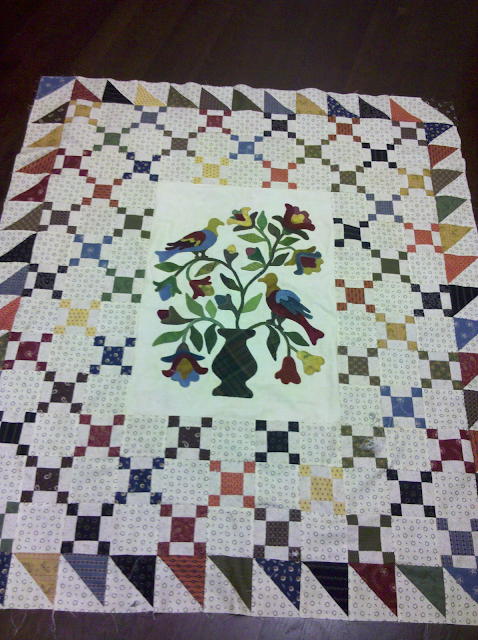 It's getting quilted this week - then I'll finish the binding and it will be ready to hang in Cinnamon's Quilt Shop. We will be kitting each of these projects ...!! I'm now working on a new design for Cinnamon's - it's going to be a "penny rug" !!! I have the wool picked out for the "coins" around the edge... now I'm designing the wool applique center. Our background fabric is Lisa Bongean's flannel that looks like wool! The flannel and wool work so well together. Using the flannel for the large piece makes the project much more economical! As soon as it progresses a little further... I'll give you some pictures! Ok...now I must get busy with the Christmas decorations. My DH was so sweet and brought everything in from the garage! eeeekkkkk.... I have tub after tub that I must go through! I sure wish he had some "decorating blood" in him so he could help. However.... he was not blessed with it! Blessed with lots of other great things...but decorating... NOT!! PLUS... I have Holly Table runner kits to cut, pack up all of my sewing essentials for a FUN, FILLED .... Christmas Retreat at Cinnamon's for the entire weekend! I get to be a participant this year.... YIPPEE!!!! We get to have a cookie exchange, make a stocking (that Santa is going to fill), ornament exchange, eat home cooked meals, sew, wear Christmas jammies.... I CAN'T WAIT!! !